Attempt two of the new plan went much better than the first go… well, the ab work at least. 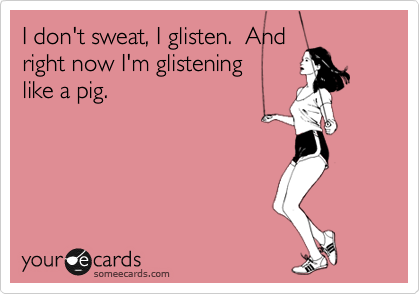 A good, sweaty workout. In a very humid gym. Oh Lord was it sweaty. And I enjoyed it! It was good to get out of my funk and thrash my body a little. Okay, not thrash so much as just a bloody good workout. Went a little crazy on the leg press… might feel that one tomorrow. The only catch? I was super hungry at the end of it, and really should have had something on hand to eat rather than wait the hour it took to get home and cook. I’m thinking a protein bar of some description. Anyone know any good protein that aren’t packed with sugar? Bonus points to those who can recommend something you can buy here in NZ! Instead of a protein bar, you can do a whey protein powder, mix with water, and drink. You can put your scoop of powder in a mixer cup or cup that won’t leak when you shake it, then fill the cup with water after your workout. Shake then drink. It’s actually a good time to drink the protein shake, that’s when your muscles need that repair. My husband and I use a whey chocolate protein powder that has 130 calories, 1.5 g of gat, 4 g carbs, and 24 g of protein. Mixing it with water is still somewhat filling and saves on calories, but you can add it to milk. It would be easier using water when you’re at the gym though. Good luck! Good to hear its coming together. I recently posted a recipe for easy home made energy bars. Simple and no rubbish in them, plus you can adapt and add your favourite bits and bobs. http://www.fatgirlslimblog.co.uk/?p=16949. Might be worth a try. I make my own meatballs for after a workout. And I pair it with a starchy veggie like squash. That way I don’t go into ketosis! I recently tried a protein bar called ThinkThin which has very little if any sugar. It’s pretty good and has lots of protein if I recall correctly. About 240 calories and comes in chocolate PB, chocolate brownie, etc.